Okay folks, in case you missed the news before, Southern Tier Brewing is into the Louisiana market! 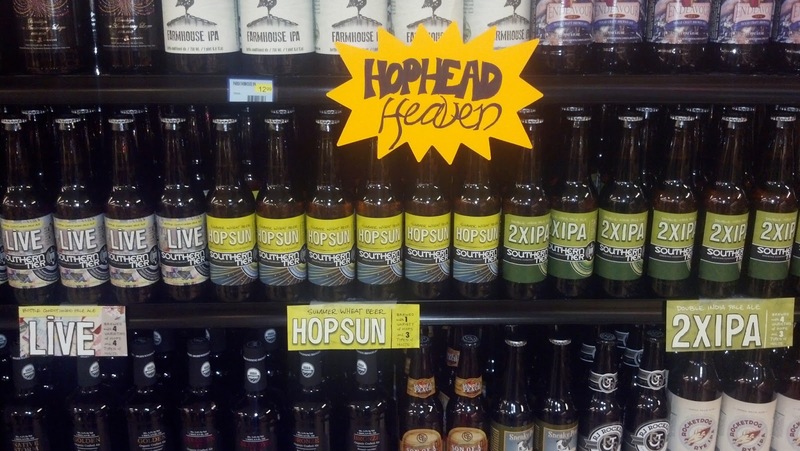 So far I've seen 6-packs of the Hop Sun, Live Pale Ale, and the 2XIPA around town, and I believe a few others have found their way to New Orleans, although they might have just been on tap at Avenue Pub. This week and the next two weeks will cover all three of the Southern Tier offerings in an effort (last week's Pliny the Elder review aside) to keep Feature Beer Friday! a little more locally available. Appearance: We all expected a little wheat haze from this one but it didn't deliver. Not that it was a bad appearance, just missing that expected aspect. Aroma: Hoppy, with some pine in there, but mostly citrus. Brenton picked up some peach notes, and we all gave good scores here. Taste: I found that the taste had even more citrus than the nose. Brenton said it had a "nice blend of wheat and hop." Dustin liked the wheat but didn't find the hops to be as strong as expected based on the aroma. Mouthfeel: A little thin, nothing special here, but nothing offensive either. Definitely good to not have an overly bitter aftertaste for a summer seasonal. Overall: Easy drinking but hoppy summer beer. Definitely a pool-lounging sort of brew. 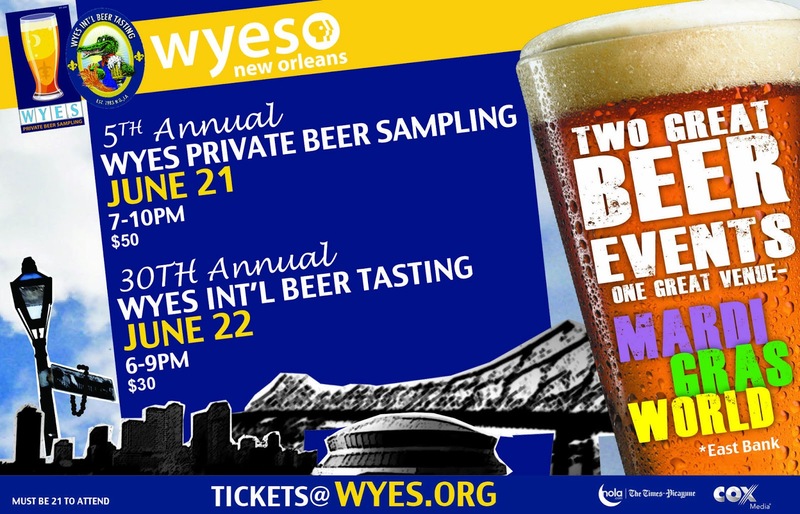 WYES 2013 Beer Tastings in New Orleans - Coming June 21-22! I was able to attend both events last year with Mandi and the Brasseurs homebrew club, and I had a great time. 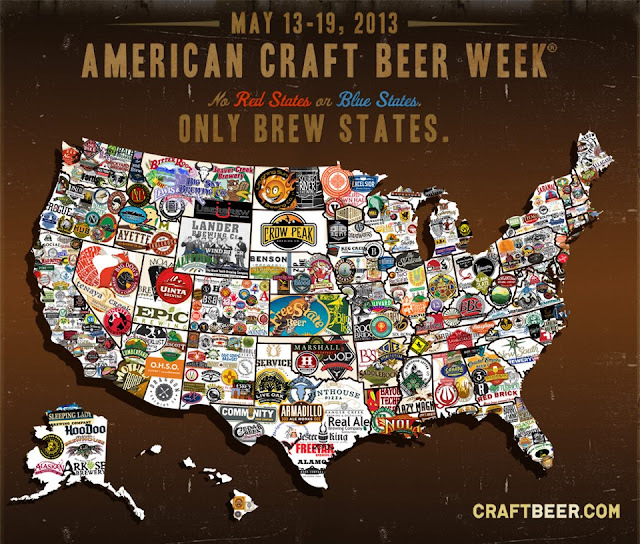 Here are links to the 2012 Private Beer Sampling and the 2012 International Beer Tasting recaps. I'll be back in 2013 to try all the new beers and serve up one of our own at the Saturday event! The beer lists aren't out yet, but the initial press release is below. When the lists are out I'll let you know some to definitely try before they are gone! Here's the link to buy tickets to either event! WYES will be holding its annual beer tastings June 21 & 22 at Mardi Gras World, 1380 Port of Orleans Place on the East Bank. Friday night's beer sampling is considered more of a VIP event due to beer makers showcasing their one-offs, casks and sometimes, new beers! PLUS, this year Chef Tom Hinyup from Sun Ray Grill will prepare tasty fare for all attendees while sampling their tasty brews. MORE DETAILS TO COME. WYES is thrilled about its 30th Annual WYES INTERNATIONAL BEER TASTING!! This year all tickets $30 in advance in honor of the anniversary. WYES has been providing beer lovers in New Orleans a signature annual fundraising event for 30 years! The money raised stays local and provides funding for future programming and outreach community events. Also, we are talking to local food trucks who will be parking outside of the event. (details to come) 4 trucks most probably. At Saturday's event, guests should come thirsty with a chance sample a choice of over 250 beers! For over 55 years, WYES has worked to inform, teach, illuminate, entertain and inspire our entire community. It is the oldest public television station serving southeast Louisiana and the Mississippi Gulf Coast, the 12th oldest in the nation, and the most utilized non-profit organization in our two states with as many as a half-million people using our broadcasts, outreach activities and website each week. We are proud to be part of the nationʼs largest classroom, the largest stage for the arts and a trusted window to the world. For more information, call (504) 486-5511 or visit wyes.org. Follow WYES on Facebook and Twitter. 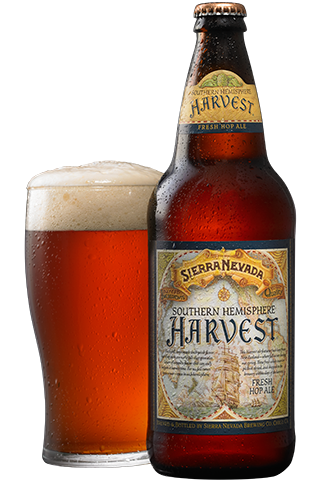 Sierra Nevada's Southern Hemisphere Harvest Ale - 2013 edition - is back on shelves in Baton Rouge, so get it while it lasts! I picked up a bottle at Cuban Liquor not too long ago with the thought of using it as a Feature Beer Friday! review, but my co-reviewers for that session were done and I drank this one with Mandi, so here's a bonus review for everyone. This should be available at all the local beer stores, and while it's limited, it won't be impossible to find. This beer is the counterpart to the Northern Hemisphere Harvest Ale, using fresh-picked New Zealand hops shipped directly to Sierra Nevada. It uses Southern Cross, Pacifica, and Motueka hops which tend to give a more herbal and floral character than North American hops. The beer pours caramel to deep red in color, with a nice frothy head and great retention. There's a sweet malt base with a good hop aroma but more spicy than floral in my opinion. The taste is hoppy as well, but I think the biscuit-ness of malt muddles the flavor a bit. The hops are mostly present on the back end and especially on the finish. Yet another solid offering from Sierra Nevada. I know sometimes people look to the new breweries in the state or the fancy new offerings, but try not to overlook Sierra Nevada. They're big, they've been here a while, but they still put out some of the best beers and some of the best beer values around. Last night I had a couple of beer friends over for some tasting / reviewing for my Feature Beer Friday! series. Typically I try to stick with locally available beers and throw in a mix of regionally available beers from TX or Alabama, but when Brenton Day of TheAleRunner.com offered to bring over a Pliny, who was I to say no? (I also stole the picture from him... he'll have to get over it.) So we're going a little out of the region today, but check back the next few weeks for some Southern Tier reviews, which just recently came to Louisiana! A little more about Pliny The Elder from Russian River Brewing... it's the third highest ranked Double IPA on BeerAdvocate, and it also has the 2nd highest amount of ratings in the top 50. So basically, a lot of people have tried it, and a lot of people love it. Russian River is from Santa Rosa, CA in wine country, but they make some of the best beers in the world. In addition to some awesome IPAs Russian River has a killer line of sour/wild ales that are among the best in the world. 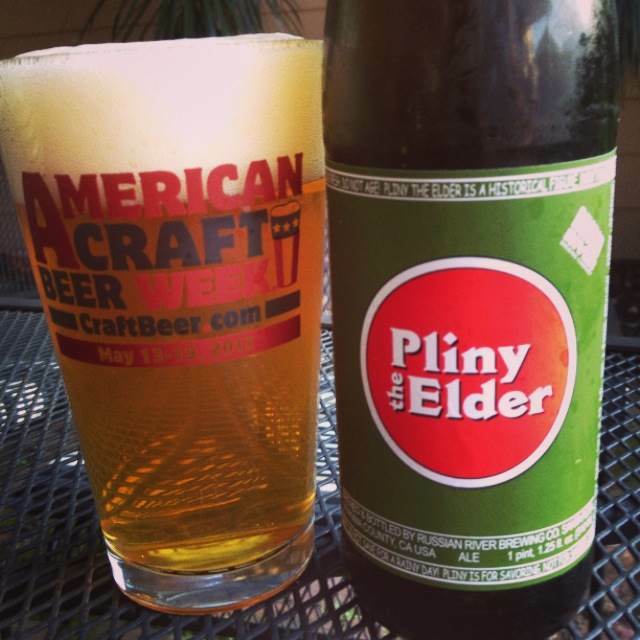 Pliny The Elder is their year-round DIPA available on draft and in bottles, and for those looking to try it I would recommend one of several websites that offers beer shipped to your door, or talk to a friend on the West coast or in Colorado and see if they'll help you out! Serving: 1 pint, 1.25 fluid ounce bottle. Appearance: "Copper color with copious amounts of head," was Dustin's comment. Aroma: Floral & citrus hops, I picked up some pine as well. Brenton said it was like a "cat pissed on the Christmas tree." He has cats, and he gave it a 23/25 so I guess that's a good thing. Taste: Brenton and I both thought it was pine dominant with the hops, but it was never so out of balance that I thought it was bitter for the sake of bitter. Mouthfeel: Easy to drink for such a big beer. Overall: This is a world-class beer and it lives up to the hype. One of the best DIPAs around, if you get the chance, give it a try! And it's time for part four of four consecutive Louisiana beers that we featured on Jay Ducote's Bite And Booze radio show. We started with the Abita Lemon Wheat, went to the NOLA Brown, then the Tin Roof Voodoo Bengal, and now the Covington Bayou Bock. Covington Brewhouse is probably the most forgotten (to me at least) Louisiana brewery just because I never really see them putting out new things. That said, I know they have plans for an IPA soon that comes from a recipe that a fellow Brasseurs A La Maison member created to win their Bombastic Brewer contest. It's pretty cool for them to work with local homebrewers and I'm also excited to see another local IPA in the works. The Bayou Bock is one of their Covington Brewhouse labels, as opposed to the Heiner Brau labels. Here's what they say about it, "This full-bodied lager is our interpretation of a classic Bavarian Heller Maiboch, a style known for its well balanced, easy-drinking character. Distinguished by its rich medium-to-dark golden color, sweet, malty aroma, and delicate, flowery hop finish, Bayou Bock makes for a perfect accompaniment to a wide range of cuisine." Unfortunately, I didn't see anywhere on the label where this was a Maibock, so we judged it more as a traditional bock, and that shows up in the scores. Appearance: Very light, clear golden color. Aroma: Grassy, earthy, with a little noble hop character. Jay and Brenton both picked up a breadiness, and a yeasty aroma more associated with bread than with beer. Taste: Malty, more like a beer, but still not what we were expecting from a bock. Still bready and pretty boring. Mouthfeel: Thin with a lingering funk to it. Not impressed. Overall: Regretably we didn't judge this as a maibock, but it's also labeled as simply a bock. For better or worse, when someone thinks "bock" then expect darker, maltier, and richer as opposed to light and grassy. Despite that, I don't think there was too much to like about this beer, it had an unpleasant funk to it and offered little redemption. 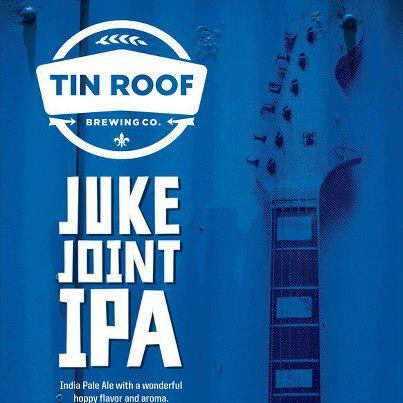 In case you needed more craft beer week in your life, I just saw that Tin Roof Brewing is going to be tapping a keg of their double-dry hopped Juke Joint IPA at Pelican House at 5:30. NOLA's Girl Scout Cookie is tapped at 6 at The Bulldog... I'm thinking there's time for both! I initially thought the NOLA Girl Scout Cookie release was going to be tonight at the Bulldog, then heard it was going to be Friday, but now I'm hearing again that it is going to be tonight. This was right there with the Tin Roof Bourbon Oak Chip Coffee Porter as far as ACBW offerings in Baton Rouge that I really wanted to try... so I'm going to head back to the Bulldog tonight. The Tin Roof offering was gone in about half an hour, so don't be too late tonight! It should be tapped at 6. They also had the Stone Enjoy By IPA on tap, so if you haven't tried it yet, there's a second reason to find yourself at Bulldog! Yeah, we're not New Orleans and as much better as the Baton Rouge beer scene has become, we still have no Avenue Pub. If you want the best that Louisiana has to offer, that's your location... or check out the Beer Buddha for other New Orleans area picks. 6 PM - The Cove - Tin Roof's "Parliament Pale Ale" will be served, which is a Voodoo Bengal fermented with 1099 Whitbread yeast. They describe it as: "Mild malty, slight fruity flavor, good flocculation, less tart and dry than normal british ale yeast." 6 PM - The Bulldog - Tin Roof Parade Ground Coffee Porter aged in bourbon soaked oak chips . Aging for 6 months! This is probably what I'm most excited about in Baton Rouge. 5:30 PM - Pelican House - Tin Roof Double Dry Hopped Juke Joint IPA— simcoe, centennial, cascade, columbus– A hop heads dream. 5:00 PM - Tin Roof Brewery - Food Truck Friday Benefiting Cancer Services of Greater Baton Roug! Live music, Food Trucks, and a great time! Goes until 9 PM. 5-6 PM - The Bulldog - NOLA Brewing has a cask of their "Girl Scout Cookie" which I believe is a mint-flavored Irish Channel Stout? I'm interested in this one for sure. All Day - The Bulldog - Pot Luck – come get the best sort of leftovers ever! Thanks to TheAleRunner, Brenton Day, for more information about the Bulldog's American Craft Beer Week events. That's all that I've seen in town, other than the "crafty" tastings that I'm not going to post about. 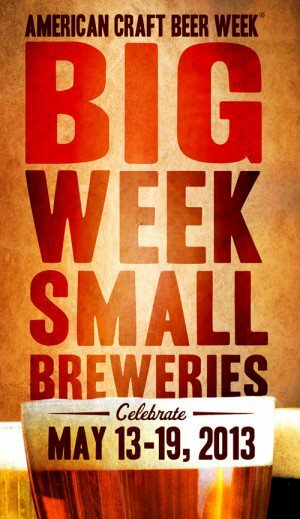 I really like that Tin Roof Brewing is stepping up their Craft Beer Week game with some special releases. I'm excited to try the NOLA Girl Scout Cookie as well. Alright, and I'm back. Sorry about missing this post last week, but sometimes life happens and it turns out Beer Blogging isn't my full-time job. Up today we have the third of four consecutive Louisiana beers that we featured on Jay Ducote's Bite And Booze radio show. We started with the Abita Lemon Wheat, went to the NOLA Brown, we're on the Tin Roof Voodoo Bengal, and next week (in theory!) will feature the Covington Bayou Bock. The Voodoo Bengal Pale Ale from Tin Roof Brewing is as it claims, an American Pale Ale. "Generously hopped, this brew draws on pale, honey and caramel malts to provide the perfect balance between bitterness, aroma, and malt character. Pairs well with anything spicy…especially crawfish, gumbo, and jambalaya." Amazingly this will be the first Tin Roof beer to make it on Feature Beer Friday!, but I doubt it will be the last. Appearance: Dark amber, decent head with good rentention. Aroma: Hoppy with a nice malt base, Brenton and Jay both picked up some citrus notes in the hops and Charles thought it had a slight syrup aroma, which makes sense considering this beer uses Steen's cane syrup in the brew process. Taste: I thought it was a pretty solid hop-forward pale ale. It has a nice balance of citrus hops and malty syrupy sweetness. Brenton described it as "pleasingly bitter" which is a great thing in a pale ale. Mouthfeel: A little lingering bitterness, but that's not a bad thing. Decent body too, good mouthfeel for the style. Overall: This is better than I remembered and I really commend Tin Roof for improving their recipe and making this isn't a really well-rounded APA. 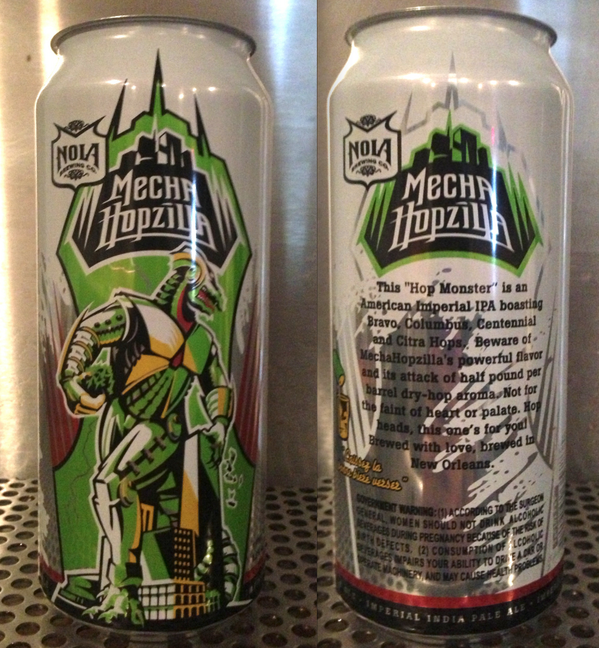 Available in cans all over Baton Rouge, I can see myself drinking plenty of this over the Summer.